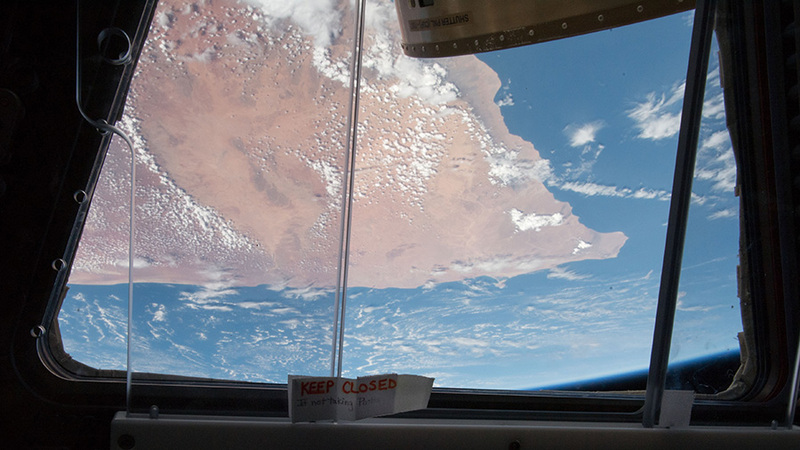 The “Horn of Africa” is seen through one of the seven windows that make up the Cupola, a dome-shaped module on the International Space Station. The space station crew will be inside the Cupola Wednesday morning operating a robotics workstation to capture the upcoming SpaceX Dragon. The SpaceX Dragon space freighter is midway on its trip to the resupply the International Space Station’s Expedition 55 crew. Waiting to capture Dragon Wednesday morning are Flight Engineers Norishige Kanai and Scott Tingle. The two astronauts have been reviewing procedures and training on a computer for Dragon’s capture for a few weeks now. Kanai will command the Canadarm2 robotic arm to reach out and grapple Dragon about 7 a.m. EDT Wednesday when it reaches a point about 10 meters away from the station. Tingle is backing up Kanai and will monitor Dragon’s approach and rendezvous from inside the Cupola. Flight Engineer Ricky Arnold will be assisting the duo by overseeing approach telemetry from a communications unit on the space station. NASA TV will begin its live mission coverage starting at 5:30 a.m.
Dragon is carrying a variety of cargo including new science experiments researching the human body, plants and how materials react when exposed to space. The Marrow study will explore bone marrow and the blood cells it produces. PONDS will explore ways to achieve uniform plant growth as astronauts supplement their diets with fresh space-grown greens. The Materials ISS Experiment Flight Facility, or MISSE-FF, will observe what happens to materials exposed to outer space phenomena such as ultraviolet radiation, charged particles and micro-meteoroids. Meanwhile, the six space station residents are keeping the orbital lab in tip-top shape today while continuing ongoing scientific studies. Commander Anton Shkaplerov stayed focused on maintenance duties in the station’s Russian segment. New Expedition 55 crew members Ricky Arnold, Drew Feustel and Oleg Artemyev had time set aside to get used to their new home in space. Tingle swapped out Combustion Integrated Rack hardware in the Destiny lab module. Kanai readied mouse habitat gear for a rodent study being delivered on Dragon. Kanai and Tingle later ended the day with more Dragon robotics practice. Saw you Flyover Red Deer Alberta Canada with Dragon following closely behind. Awesome! What a sight to see!